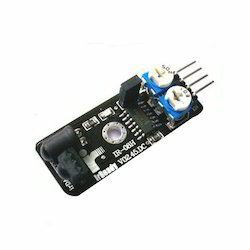 Providing you the best range of pulse sensor heart rate sensor arduino, e18 d80nk ir sensor, ir wireless remote control arduino, flame sensor module arduino, infrared obstacle avoidance sensor and gp2y0a21 10-80cm infrared distance sensor with effective & timely delivery. Another great infrared sensor. 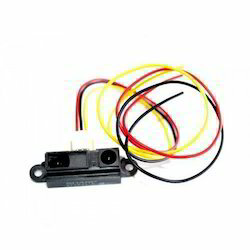 This infrared sensor can be powered with 5V and detection distance can be adjust from 3cm to 80cm with NPN output. It can be used at automation machine, mobile robot for obstacle detecting. The sensor provides a non-contact detection.The implementations of modulated IR signal immune the sensor to the interferences caused by the normal light of a light bulb or the sun light. 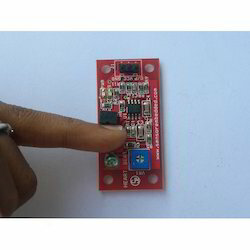 This is an Infrared Transmitter and receiver which together make up a photoelectric sensor. The sensor has a long detection distance, and has less interference by visible light because it uses modulated Infrared light. This sensor has a screwdriver adjustment to set the detected distance, then gives a digital output when it senses something within that range. This sensor does not return a distance VALUE. IR is widely used in remoter control. With this IR receiver, the Arduino project is able to receive command from any IR remoter controller if you have the right decoder. Well, it will be also easy to make your own IR controller using IR transmitter. The IR Remote Receiver Electronic Brick has 3 pins. From left to right they are: (G) Ground, (V) Voltage, (S) Signal. BUT the marking sometimes vary on the little circuit board. In this photo they are marked G-R-Y. The 3-pin cable in the photo has the typical color code: (G) Ground = Black, (V) Voltage = Red, (S) Signal = White. This brick also comes with the IR Infrared Robot Remote Control Kit which has a remote with arrow buttons for direction etc. (Scroll down for example). It is also in the YourDuino Electronic Brick Set. There are many different IR remote controls. Some from YourDuino.com are the low-cost IR Infrared Remote Control Kit 2 and also the IR Remote included as part of the MAKER Version Electronic Brick Starter Set Then, there are the typical TV and Stereo Remotes. All of these may have different encoding methods and number of physical buttons, and different codes received when a button is pressed. Below we will give example Software Sketches for a few common IR Remotes. Flame module Interface module and number 13 comes with LED build a simple circuit to produce flame warning lamp 13 comes with digital interfaces of the LED, the flame sensor connected digital three interfaces, when the flame sensor senses There are key signal detected, LED lights, otherwise off. The module is mainly used to detect the infrared light. It outputs digital signal 0 and 1 through a Comparator output. The output value will be 0 C when infrared light is detected. And the sensitivity is adjustable by the precision potentiometer. VCC...... Positive voltage input: 5v for analog 3.3v for Digital. Induction to object 0, not induction when output 1, can be directly and 3 v and 5 v SCM IO port connected. Speed is quick, is suitable for intelligent car obstacle avoidance, black and white line trace, prevent drop, the product counter, line cutting, liquid level detection, etc. Use the sensor made of black and white line tracing cars need not in the white paper on the black line running, can be in cement, yellow and complex environment tour line trace. As long as the color of periphery of the black line than black slightly shallow can, eliminate the traditional move, make the environment layout more simple. 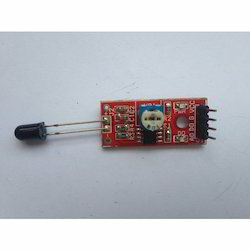 This sensor 3 to 6 v power supply, range ultra wide, suitable for 3 v and 5 v of the single chip microcomputer system. Take that can end, EN end is equal to "1" sensor doesn't work, equal to the "0" while you work. Sensors on jumping on cap after EN end long-term ground (EN long-term as "0"). To use EN end when you take off the jump cap. Frequency adjust potentiometer is used to adjust infrared transmitting tube carrier frequency, because integration receiving head in a particular 38 KHZ carrier frequency is the most sensitive. Will 502 resistance clockwise transferred to do (that is, the brightness of the tube will be transferred to the maximum), then alignment white wall adjustable 103 resistance, has been transferred to the induction farthest distance is so far, this sensor has been working in the best state. The distance sensor produced by Sharp is a popular and relatively low cost solution for measuring distance. The sensor can be used also for measuring the rightness or color (in very limited extent) but in this article we will talk only about measuring distances.The Sharp distance sensors are a popular choice for many projects that require accurate distance measurements. This IR sensor is more economical than sonar rangefinders, yet it provides much better performance than other IR alternatives. Interfacing to most microcontrollers is straightforward: the single analog output can be connected to an analog-to-digital converter for taking distance measurements, or the output can be connected to a comparator for threshold detection. The detection range of this version is approximately 20 cm to 150 cm (8" to 60"); a plot of distance versus output voltage is shown below. The GP2Y0A02 uses a 3-pin JST connector that works with our 3-pin JST cables for Sharp distance sensors (included). It is also simple to solder three wires to the sensor where the connector pins are mounted (see the lower picture to the right). When looking at the back, the three connections from left to right (last picture) are output signal, ground, and the power. This module uses bright infrared (IR) LED and a phototransistor to detect the pulse of the finger, a red LED flashes with each pulse. The LED is the light side of the finger, and phototransistor on the other side of the finger, phototransistor used to obtain the flux emitted, when the blood pressure pulse by the finger when the resistance of the phototransistor will be slight changed. We choose a very high resistance resistor R1, because most of the light through the finger is absorbed, it is desirable phototransistor sensitive enough. Resistance can be selected by experiment to get the best results. The most important is to keep the shield stray light into the phototransistor. For home lighting that is particularly important because the lights at home mostly based 50Hz or 60Hz fluctuate, so faint heartbeat will add considerable noise. 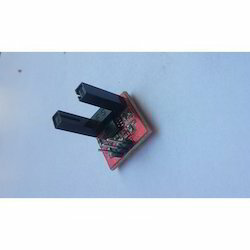 This module is used for intelligent vehicle, robots and other automated mechanical device to provide a versatile infrared detection system solutions. This is a groove type opto-coupler sensor which will output high 1 when an object is detected in the groove. Using imported groove optical coupling sensor, width 10mm. It have the output state light, if output high level, the lights are off. If output low level, it on. If it covered, it will output high level; otherwise it output low level. VCC GND OUT use 2.54mm standard pins to ease the connections. Has output status indication led, when output high TTL LED off, and vise versa. When objects in the groove output high TTL, vise versa. Output valid signal is low. Work piece can be used for counting, motor speed. For debugging purposes, this module is equipped with on-board LED that will light up when the output terminal valued logic HIGH. The supply to the sensor should be checked. The connection to the microcontroller should be checked. Not more than the operating voltage, supply should be given to the sensor. Looking for Heartbeat LR LDR Count Line Sensor ?